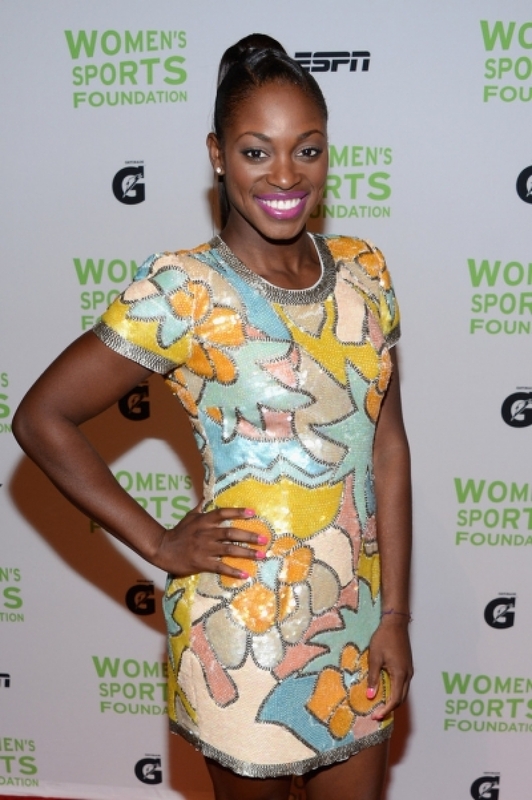 Sloane Stephens is an American professional tennis player who as of April 29, 2013 is ranked World No. 17 by the Women's Tennis Association (WTA). Stephens has yet to make a WTA Tour singles final, having reached four semifinals including one at the 2013 Australian Open, where she defeated Serena Williams in the quarterfinals. 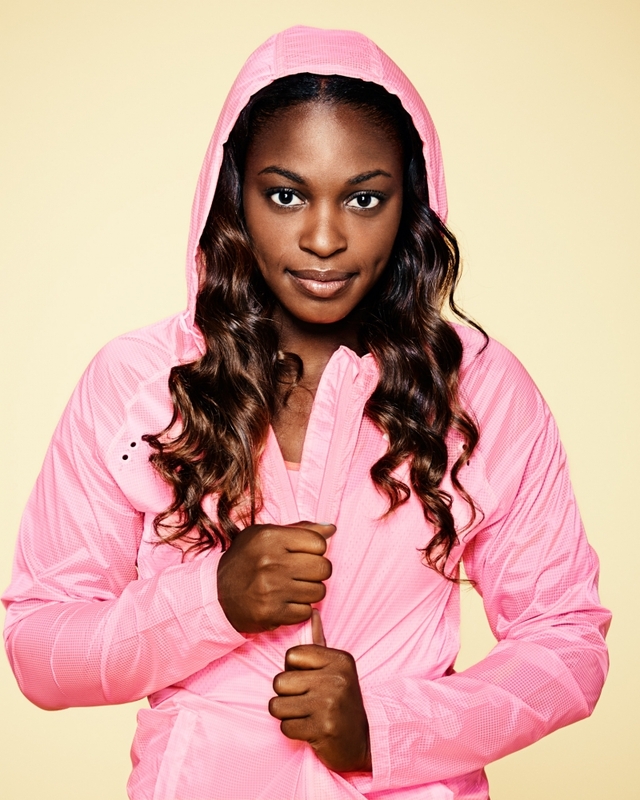 Stephens is considered a rising star in women's tennis. Stephens was born in Plantation, Florida to Sybil Smith (who, in 1988 as a swimmer at Boston University, became the first African-American female to be named First Team All-American in Division I history) and John Stephens, a professional American football player.John Stephens was killed in a car accident on September 1, 2009, just before the start of the US Open. Stephens attended her father's funeral in Louisiana, but remained entered in the US Open. Stephens' younger brother, Shawn Stephens, plays baseball and football at Notre Dame High School in Los Angeles. She started playing tennis at the age of nine, when her mother introduced the sport to her, and she changed to home-schooling at the age of 12. She graduated from high school in 2011. Stephens currently splits time between her home in Florida and Los Angeles, where she trains at the USTA training center in Carson, California. She stated that her favorite surface is clay when she entered the 2012 Wimbledon Championships. She has cited Kim Clijsters, Venus Williams and Serena Williams as her main inspirations in tennis. She also cited her grandfather as her biggest influence growing up. Her goal in tennis is to become the best person and player that she can be. 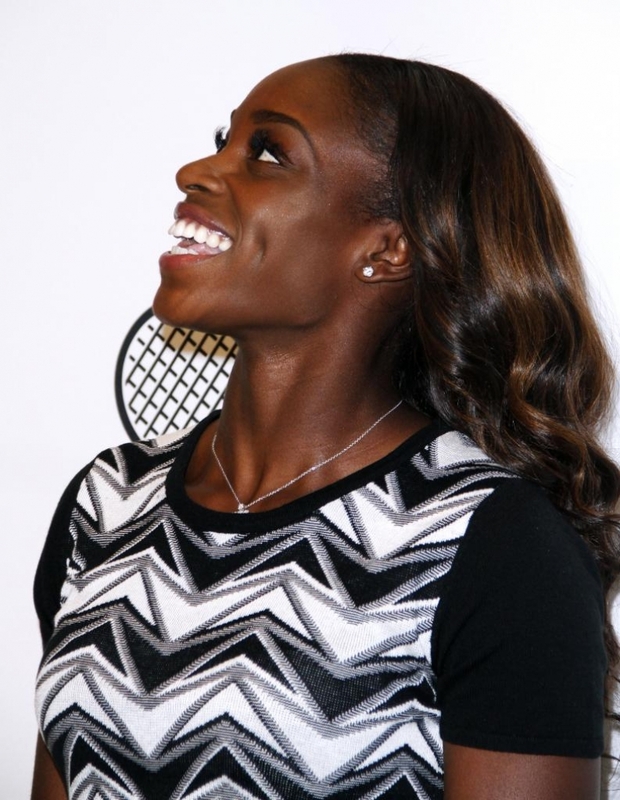 Off court, Stephens has been featured in Vogue, Teen Vogue, ESPN The Magazine, USA Today, and Sports Illustrated. She also enjoys posting inspirational tweets to her friends and followers via @sloanetweets and currently has over 60,000 followers. Sloane roots for the Los Angeles Dodgers, UCLA Bruins, and the Charlotte Bobcats. She is sponsored by Under Armour, Head, American Express, Johnson & Johnson, and USANA Health Sciences. Sloane is managed by Lagardère Unlimited. Stephens is an all-court player. She hits her forehand with a large swing and as a result the shot can be either a strength or a weakness for her. Stephens sports a powerful two-handed backhand. Cross-court Sloane tends to hit a very steady ball, oftentimes hoping to run around her backhand in order to hit an aggressive forehand. Stephens often finishes points at the net and is a competent volleyer. In her 2013 Australian Open match against Serena Williams, she won 18 of 20 (90%) net points. She also has a good serve with a very fluid motion. Stephens often stays well behind the baseline, relying on her athleticism to chase and return balls. She is capable of defending against powerfully-hit shots, and occasionally turns defensive shots into offensive shots. 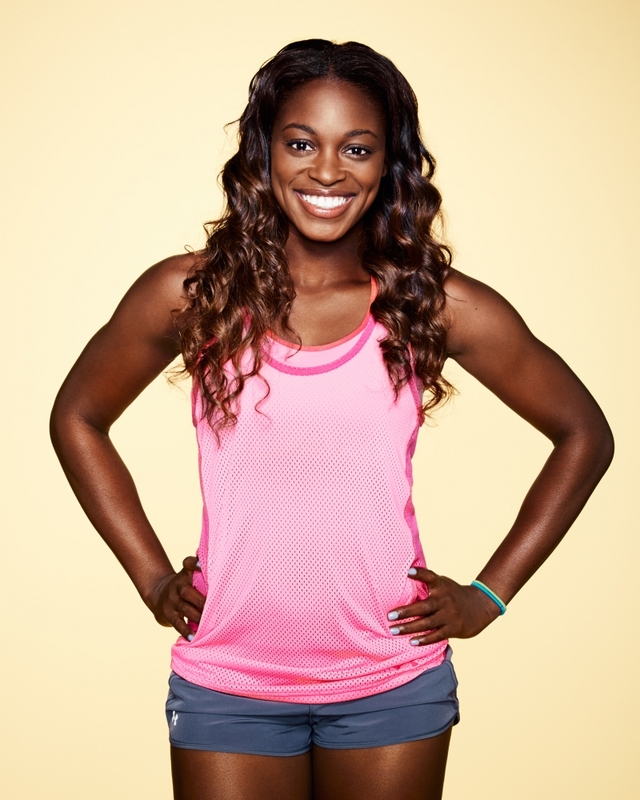 Fitness is one of Stephens' biggest strengths on the tennis court. Stephens had a breakthrough year in 2008, when she finished the US Open Junior doubles as runner-up alongside partner Mallory Burdette.Later at the Grade A Orange Bowl, she made it to the semifinals as a wildcard, before losing in three sets to compatriot Christina McHale. Stephens continued her form in 2009, capturing the singles and doubles titles at Grade 1 USTA International Spring Championships (partnering Mallory Burdette). Stephens then traveled to Italy, where she captured the Grade A Italian Open singles title. The following week, Stephens participated in her first overseas junior Grand Slam, the French Open. As a qualifier, Stephens reached the semifinals, before losing to eventual champion Kristina Mladenovic. 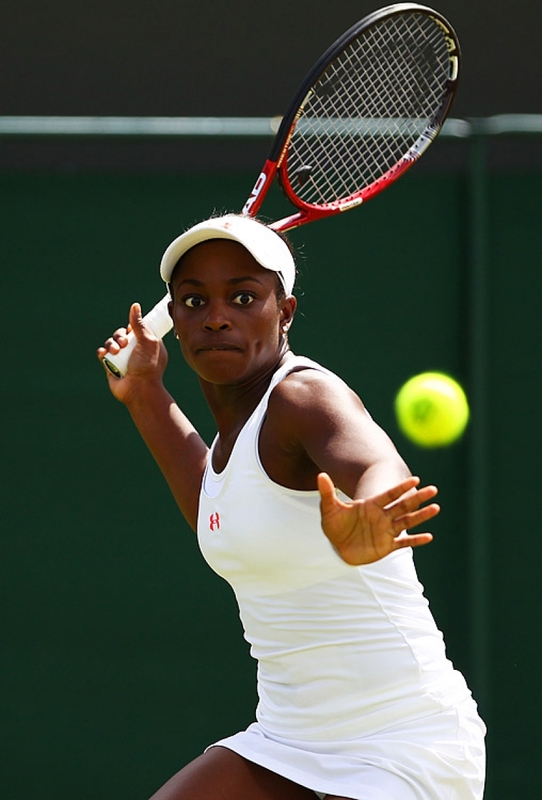 The following month, Stephens reached the quarterfinals at the junior Wimbledon, before losing again to Mladenovic. Stephens reached a career-high junior ranking of world no. 5 on August 10, 2009. Seeded fourth at the junior US Open, Stephens lost in three sets to 14th seed Jana ?epelová in the first round. 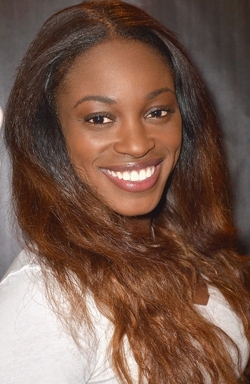 At the 2010 Junior Wimbledon Championship, Sloane made it to the quarterfinals of the singles and won the doubles title with Tímea Babos, winning a tough three-setter in the final. Stephens played her first professional events on the ITF Circuit in late 2007. In spring 2008, Stephens received a wildcard into her first WTA event, the Sony Ericssson Open in Miami, but lost to Ekaterina Bychkova in the first round. During the summer, Stephens won a small ITF doubles tournament with partner Christina McHale. She received a wildcard into the US Open qualifying rounds, where she defeated seventh-seeded Melinda Czink, but then lost in straight sets to Stefanie Vögele. In 2009, Stephens began the year playing several ITF tournaments with moderate success. She received another qualifying wildcard into the Sony Ericsson Open, losing in the first round to Akgul Amanmuradova. In the summer, Stephens received another qualifying wildcard into a WTA tournament: the LA Women's Tennis Championships. There, Stephens won her first WTA match against Lenka Wienerová, but fell in the second round of qualifying to Anastasia Rodionova. During the summer, Stephens played World Team Tennis for the New York Buzz. Stephens' last professional tournament of the 2009 season was the US Open, where she received a qualifying wildcard for the second year in a row. Stephens lost in the first round of qualifying. In October, Stephens turned professional when she signed with BEST. Stephens qualified for the 2010 BNP Paribas Open, where she defeated Lucie Hradecká in the first round. She then lost against the defending champion, 12th-seeded Vera Zvonareva. Stephens made another run at the 2011 BNP Paribas Open, where she defeated fellow American Jamie Hampton in the first round. In the second round, she lost to world no. 1, and eventual champion, Caroline Wozniacki. The next week, as a wildcard entry, she won both matches at the qualifying stage of the 2011 Sony Ericsson Open to qualify for a spot in the main draw. In May 2011, Stephens won the $50,000 2011 Camparini Gioielli Cup. It was her first tournament win on the ITF circuit. Stephens then participated in the qualifying draw of the French Open as the 21st seed. She beat Anastasia Pivovarova in the qualifying competition to qualify for the main draw event. She lost to Elena Baltacha in the first round. At the 2011 Wimbledon Championships, Stephens was the 12th seed in qualifying. She lost in the second round to Nina Bratchikova. Following her improved performance at Wimbledon, she reached a career-high ranking of world no. 125 on July 4, 2011. Stephens was given a wildcard in San Diego, Stephens made her first WTA quarterfinals, defeating Julia Görges en route. However, she lost to Andrea Petkovic in the quarterfinals. She then lost in the first round of Cincinnati and the final qualifying round of New Haven. Being granted a wildcard to the US Open, she won her first main-draw Grand Slam match by beating Réka-Luca Jani in the first round. She backed up this win by beating 23rd seed Shahar Pe'er in the second round. She then lost to former world no. 1 Ana Ivanovic. Stephens ended the year as the youngest player in the year-end top 100, at no. 97. In 2012, Stephens reached the second round of the Australian Open, where she lost to 18th seeded Svetlana Kuznetsova. Stephens was then given a wildcard to play in the 2012 Indian Wells Masters, where she made it to the second round. She then qualified for the 2012 Miami Masters, where she advanced to the third round, defeating 30th seed Sara Errani in the second round. After the Miami Masters, she travelled to Ukraine, where she enlarged USA's lead to 5-0 following a win with Liezel Huber in the doubles tie against Lyudmyla Kichenok and Nadiya Kichenok. After failing to qualify for the 2012 Madrid Masters, she qualified for the 2012 Internazionali BNL d'Italia and advanced to the second round. Stephens then traveled to Strasbourg. She advanced to the second round after Maria Kirilenko retired. Stephens then beat fellow teenager Tímea Babos, before advancing to the semifinals with a straight-set win over Ayumi Morita. Stephens was defeated in the semifinals by former French Open champion Francesca Schiavone. It was Stephens' first trip to the semifinals of a WTA tournament. Stephens advanced to the fourth round of the 2012 French Open by defeating Ekaterina Makarova, Bethanie Mattek-Sands, and Mathilde Johansson. In the fourth round, she lost to sixth seed Samantha Stosur in two sets. Stephens advanced to the third round of Wimbledon by defeating Karolína Plíšková in the first round and upsetting 23rd seed Petra Cetkovská in three sets in the second round. In the third round, she lost to German Sabine Lisicki. 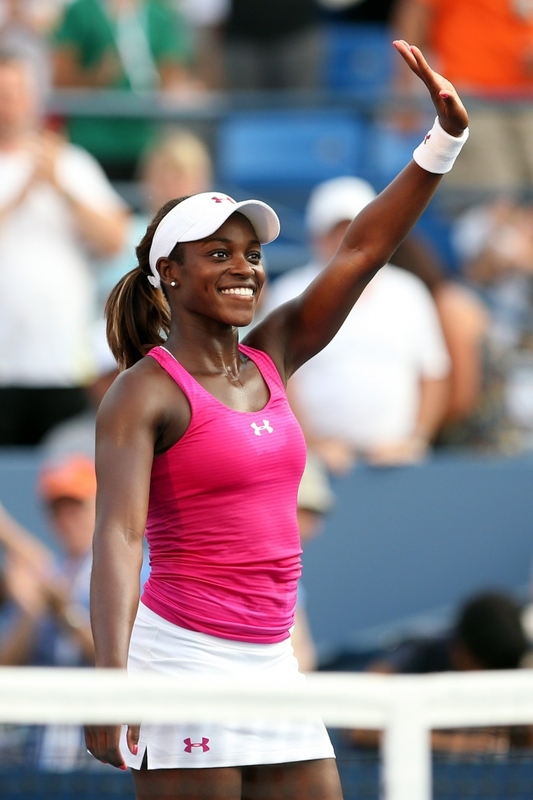 Stephens travelled to Washington, D.C. to compete in the 2012 Citi Open. She was seeded third. She defeated Sesil Karatantcheva in the first round, Michelle Larcher De Brito in the second, and Eugenie Bouchard in the quarterfinals, but fell to Magdaléna Rybáriková in the semifinals. In New Haven, she defeated seeded 33rd Austrian Tamira Paszek, but suffered a three-set loss to 11th seed Marion Bartoli. In the 2012 US Open, she participated in Women's Singles, Women's Doubles with Tímea Babos, and Mixed Doubles with Rajeev Ram. In the first round of singles, she stunned 22nd seed Francesca Schiavone in front of the home crowd in the Louis Armstrong stadium. She then defeated Tatjana Malek in the second round. Stephens then faced 12th seed Ana Ivanovic of Serbia. Ivanovic was two games away from losing against American crowd favorite Stephens, but she managed to dig deep and prevail in a marathon three-set win with plenty of dramatic points and shifts in momentum. In women's doubles, she and Babos lost in the first round against Janette Husárová and Magdaléna Rybáriková. In mixed doubles, Stephens and Ram defeated Bethanie Mattek-Sands and Horia Tec?u, who were the champions in the 2012 Australian Open, but the pair retired in the second round. Later, Stephens said she had been playing with a torn abdominal muscle, which she initially injured during the fourth round at Roland Garros. "I kept playing when I shouldn't have", she told Tennis Now. 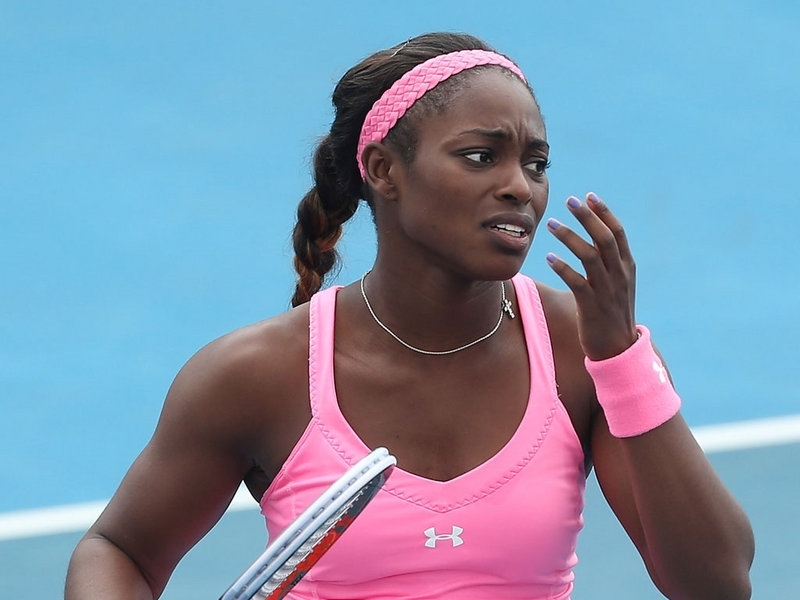 Stephens ended the year as the youngest player in the year-end top 50, and the only teenager. Stephens began the year by reaching the quarterfinals of the 2013 Brisbane International, defeating Dominika Cibulková and Sofia Arvidsson en route before losing to Serena Williams in straight sets in the quarterfinals. The following week, Stephens reached the semi-finals of the 2013 Moorilla Hobart International, where she was seeded eighth. She defeated Laura Robson, Simona Halep and Lauren Davis en route before losing to the eventual champion, Elena Vesnina in straight sets. Stephens achieved a new career high singles ranking of World No. 25 following the event. At the Australian Open, Stephens was seeded 29th. She defeated Halep, Kristina Mladenovic, Laura Robson and Bojana Jovanovski to reach her first Grand Slam quarterfinal where she defeated World No. 3 and tournament favorite Serena Williams in three sets to reach the semi-finals. There, she lost a controversial match to the World No. 1 and defending champion, Victoria Azarenka. 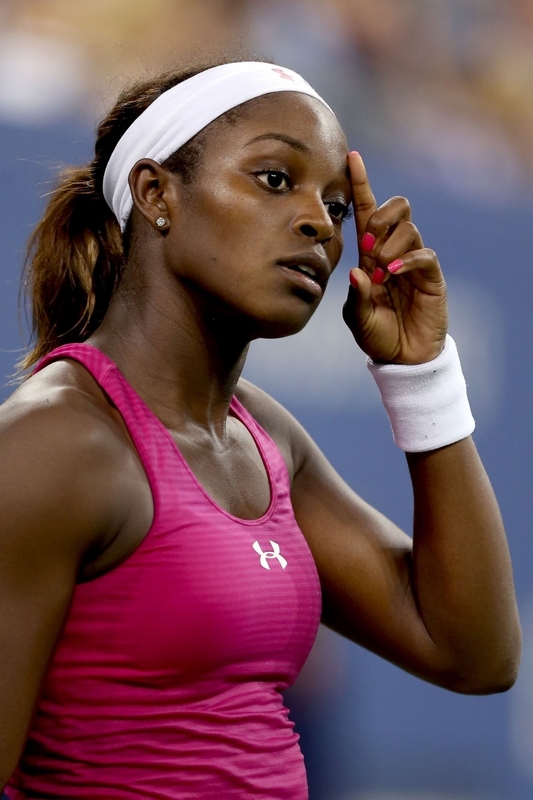 However, as a result of reaching the semifinals, Stephens achieved a new career high singles ranking of World No. 17 following the event, making her the youngest player (and the only teenager) in the top 20. 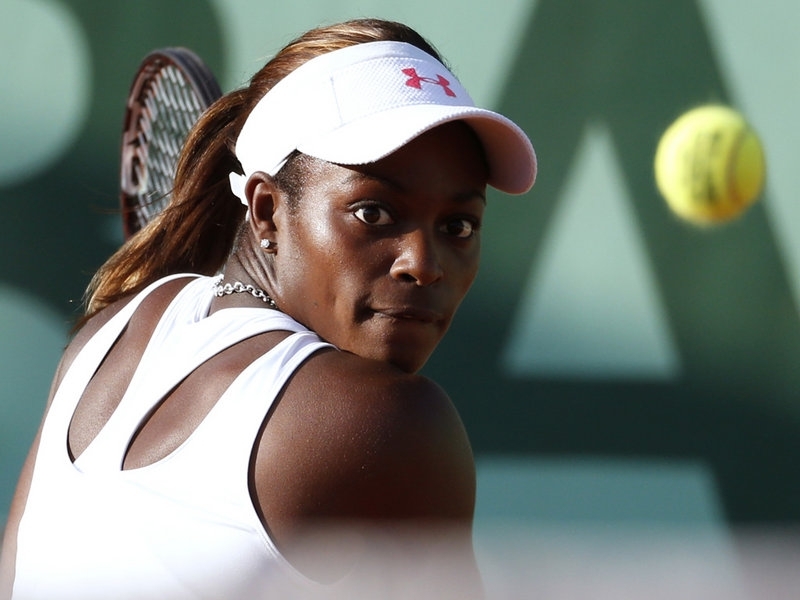 Following the Australian Open, Stephens pulled out of the first round Fed Cup tie for United States against the third-seeded Italy due to a strained abdominal muscle. She lost her opening round matches in Doha, Dubai and Indian Wells before reaching the fourth round of the 2013 Sony Open Tennis after defeating Olga Govortsova and receiving a walkover Venus Williams in the third round. However, she lost to the 4th seed and defending champion Agnieszka Radwa?ska in three sets. Stephens then lost in the second round of the 2013 Family Circle Cup to Bethanie Mattek-Sands after receiving a first round bye. She then lost her match against Sofia Arvidsson during the 2013 Fed Cup World Group Play-offs, but the United States Fed Cup Team defeated Sweden 3–2 to secure themselves a place in the 2014 World Group. Stephens' poor form continued as she lost to Daniela Hantuchová in the opening round of 2013 Mutua Madrid Open. Stephens snapped her losing streak at the Internazionali BNL d'Italia by defeating Flavia Pennetta and Kiki Bertens to reach the third round where she lost to the World No. 2 and two-time defending champion, Maria Sharapova. She lost her quarterfinal contest in the Brussels Open. In the 2013 French Open, she defeated Karin Knapp in the opening round and Vania King in the second round. She battled past Marina Erakovic in the third round, but then lost in in straight sets to second seed Maria Sharapova.